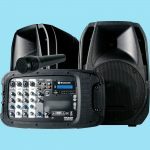 Our hire shop has an extensive range of audio and PA (Public Address) systems and components available for small to medium venues. 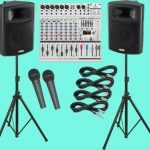 As each venue and event is different our experienced hire shop staff can help you to select the correct equipment for your needs, from microphones and mixers to amplifiers and speakers along with all the cables, stands and sundries. Our Hire shop has a range of Powered (also known as active) Speakers that have an internal power amplifier, thus simplifying setting up as no separate power amplifier is required. Each powered speaker needs to be connected to the 240V mains supply as well as a signal cable from the audio mixer. Passive Speakers get their power directly from the power amplifier and thus only require a single speaker cable connection from the power amplifier to the speaker. Both powered and passive speakers can be hired with robust speaker stands so that the sound can be set to the head height of the audience – aiding intelligibility and coverage. 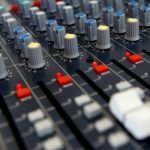 We have a range of mixers for hire that take individual audio ‘ingredients’ from microphones, instruments, MP3 Players etc. and combine them into a single ‘mixed’ output to be fed to the speakers for the audience to listen too. Some mixers can be hired with integral power amplifiers and provide a convenient single box solution to your audio production requirements. You can also hire our stand alone mixer desks and power amplifiers for the ultimate in configuration ability to exactly match the venue requirements and your needs. We have a range of microphones for hire including dynamic, condenser and shotgun models through to complete radio microphone systems for the ultimate in performance movement and don’t forget we hire microphone stands too. Used to allow closed circuit communication between the back stage and the control desk operators, hiring our talk back system can take your production to the next level. Master units provide power to the connected sub units, while plug in head sets with integral microphones provide comfort and near silent operation. Our hire shop can provide the essential leads and cables to link your audio equipment together. From point to point patch leads for interconnection between microphones, mixers and amplifiers to multi-core stage cables that allow up to 24 channels of balanced audio to be routed in a single cord run, we can meet your needs.